Dimensions 1.50 by 5.50 by 6 in. Serial murderers; California; San Francisco; Fiction. The Jackson women, Indiana and Amanda, have always had each other. Yet while their bond is strong, mother and daughter are as different as night and day. While her mom looks for the good in people, Amanda is fascinated by the dark side of human natureâas is her father, the SFPD's deputy chief of homicide. Brilliant and introverted, Amanda is a natural-born sleuth addicted to Ripper, the online mystery game she plays with her beloved grandfather and friends around the world. When a string of strange murders occurs across the city, Amanda plunges into her own investigation. But the case becomes all too personal when Indiana suddenly vanishes. Now, with her mother's life on the line, the young detective must solve the most complex mystery she's ever faced before it's too late. 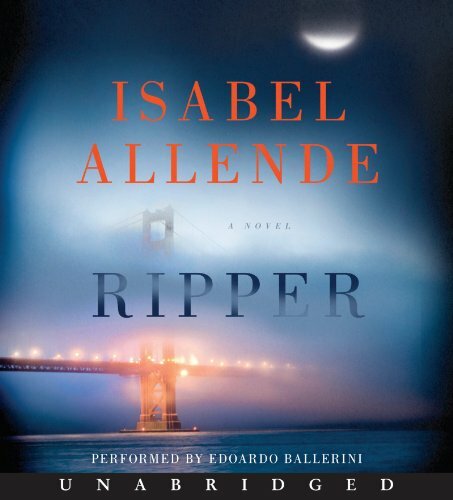 About: Isabel Allende—the New York Times bestselling author whose books, including Maya’s Notebook, Island Beneath the Sea, and Zorro, have sold more than 57 million copies around the world—demonstrates her remarkable literary versatility with Ripper, an atmospheric, fast-paced mystery involving a brilliant teenage sleuth who must unmask a serial killer in San Francisco. About: Pub Date: 2014-01-28 Pages: 496 Language: English Publisher: HarperCollins A gripping thriller from the bestselling Isabel Allende For Amanda Mart & iacute; n and her friends. With Adrienne Martine-Barnes, Diana L. Paxson | from Avon Books (July 1, 1996); titled "Sword of Fire and Shadow: The Third Chronicle of Fionn Mac Cumhal"
With Edoardo Ballerini (other contributor) | Unabridged edition from Harperaudio (January 28, 2014); titled "Ripper: Ripper Cd"
About: The Jackson women, Indiana and Amanda, have always had each other.